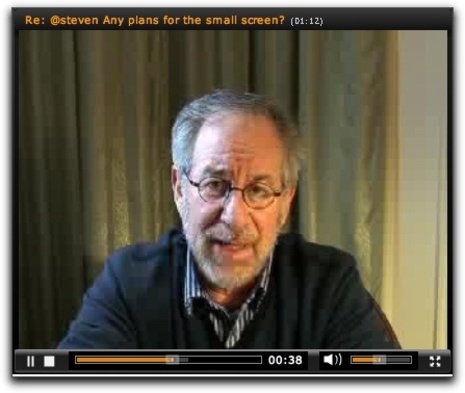 Steven Spielberg hits Seesmic nearly now video conf. Who says social media doesn't bring people closer, and even allow to you to connect with seriously famous and cool people those non-digiratis could only dream of? Jemima was amongst many posing questions directly to Steven Spielberg and Harrison Ford on Seesmic, the video discussion site from long-time ScotEduBlogger friend Loic Lemeur, ahead of the launch of the new Indiana Jones film. You can see some of the Q&A on the Guardian's PDA blog. Nearly now video conferencing is something that I'll be experimenting with inside Glow, the national schools intranet here in Scotland, with some exciting names already booked up for live debates and nearly live explorations around the world. Hopefully you'll be up for experimenting, too, whether you're 'in' Glow or sitting outside it. Whether LTS get Spielberg, though, is another matter. We've ended up having a different force with us. Could you get George Clooney and David Coverdale into a GLOW meet please, please, please Ewan? I'd be camping out by my computer for them ! !